If you’ve found your way to The Penny Hoarder, you’re probably interested in creative ways to make money. And if that’s true, you have probably figured out by now that participating in rewards programs for brands that you already use is a great way to earn a few dollars. Here’s how to decide which rewards programs to join, plus how to maximize your rewards. Which Rewards Programs Should You Join? You have to decide which rewards programs are worthwhile — and this answer will be different for everyone. For example, I don’t participate in every single program I encounter, because it can be a lot to keep straight. But I do participate in programs for the brands I regularly purchase. For me, that includes My Coke Rewards, Kellogg’s Family Rewards, Pampers Rewards, Starbucks Rewards and MyCatPerks from Purina. Do I Purchase These Products Regularly? To save money, I often buy store brands, generics or whatever is on sale. But for some things, like classic Coca-Cola, I am simply not satisfied with the quality or taste of a cheaper brand. To me, it’s worth paying a little more for those brands, and I always choose to participate in their rewards programs. If the program requires a lot of work to earn a few points, it may not be worth it. Some programs want you to write product reviews or clip proofs of purchase and physically mail them in. Other programs (like My Coke Rewards and Pampers Rewards) just require entering product codes you find on their products, and I like the ease and simplicity of these requirements. With Starbucks Rewards, you get points automatically if you pay with a registered gift card. Easy peasy! Most rewards programs have free sign-ups and many cover the cost of mailing your rewards once you’ve earned them. But some don’t! If you earn enough points to redeem them for a reward that would have cost $5 if you bought it at the store, and you have to pay $5 in shipping, you’ve just wasted your time. Also, consider the cost of postage if the program requires you to physically mail in proofs of purchase. I try to peruse a sampling of the rewards offered by a program before I enroll. If you’re not interested in anything in their reward catalog, the program may not be a great fit for you. Once you’ve decided to enroll in a program, use these strategies to make the most of your participation. I keep a Word document with the websites, usernames and passwords associated with each rewards account, so checking my balances or adding new points is easy. Points are great, but they are not worth enough for you to spend extra money in order to get them! Just purchase as you regularly would and let the points add up slowly. Product codes are a great way to earn points, but some companies, like Kellogg’s and Pampers, also post bonus codes online. These are different from the single-use codes you’ll find on products, because many people can redeem each one. Following your brands on Facebook and Twitter is one way to make sure you don’t miss any codes. You can also find updated lists of bonus codes on websites like Hip2Save and freebies4mom. In some programs, your points will expire after a certain amount of time if you don’t enter new ones. My Coke points expire when you don’t enter a new code for 90 days. Be familiar with the policies so you don’t lose your hard-earned points! My Coke Rewards lets you choose from several bonus offers when you level up from Bronze to Silver status, and again when you move from Silver to Gold. I chose a $10 gift card to restaurant.com, which I used to eat at my favorite Indian restaurant! Kellogg’s Family Rewards is always changing their special offers. For a while, if you entered codes from three specially marked packages, you could choose a free Scholastic book. For another offer, if you entered enough codes from certain cereals, they would send you a $5 check. Right now, if you enter codes from specially marked Pop Tarts boxes, you can get an Avengers bobblehead doll. Pampers has a great program called Grow On where, if you enter a code every month for the first year, you get a reward every three months. You can’t miss a month, but the rewards get better every quarter. At three months, I ordered super-cute address labels with my baby’s picture on them (they even paid for shipping!). For six and nine months, I chose bonus points, and for 12 months, I will get this adorable wooden instrument set from Melissa & Doug. You should always consider which rewards will get you the most value for your points. For example, in the Kellogg’s rewards catalog, a $5 gift card to American Eagle costs 7,500 points, and $1-off coupons for Cheez-Its are 850 points. So, for the coupon, a dollar costs 850 points, but for the gift card, a dollar costs 1500 points. So clearly the coupon is a better deal if you regularly buy Cheez-Its. Plus you’ll get the bonus code from that product! I regularly redeem Kellogg’s points for $5 gift cards to Starbucks. I’m enrolled in the Starbucks loyalty program, and I’ve achieved gold status in that program just by using the gift cards that I get from Kellogg’s. So now I also get rewards from Starbucks for being a gold member — including a free drink on my birthday, free refills on brewed coffee and tea, and a free drink or food item every 12th visit — all without spending any money out of my pocket at Starbucks! I really enjoy participating in these programs. I love getting rewards in the mail or having gift cards credited to my account. It makes me so sad that people throw away reward codes all the time without using them. They’re like free money! Don’t throw that money in the trash — make it work for you! 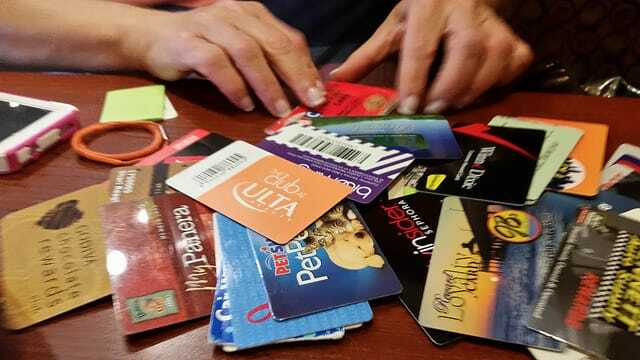 Your Turn: Do you collect points in rewards programs? Which programs are your favorites?